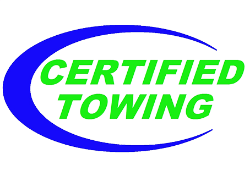 Certified Towing's fleet of wreckers, flatbeds, and capable staff allow for efficient and safe towing of all vehicles. Lifted or lowered, large or small, call Certified. Family owned and operated out of the San Francisco Bay Area since 1965. Experienced, professional, trustworthy services available 24 hours a day. 7 days a week. Get the job done right the first time with Certified.